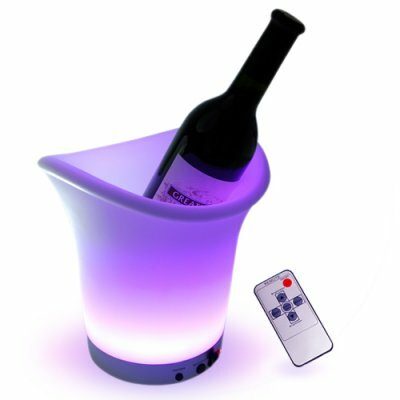 Successfully Added LED Color Changing Ice Bucket with Remote Control to your Shopping Cart. LED color changing ice bucket with remote control. Would you like to dress up your kitchen or jazz up your dining table? Own a restaurant and want to really make your bar area stand out? Well here is the answer, the multi-color LED ice bucket. Can be used in a single static (fixed) color or simply press the remote control to produce color changing effects. This LED color changing ice bucket is capable of emitting Red, Green, Blue, plus four additional bright colors. Designed in size to hold one standard size bottle of champagne or wine plus ice, it can also hold beer, coke, or similar drinks you want to keep handy. LED color changing ice bucket with fixed and rotating color options. Sized to hold one large bottle of alcohol plus ice. Do I have to use this as an ice bucket? No. You can use it to hold beer, coke, houseplants, coins, whatever you like. How do I clean the bucket? You can clean the inside and outside of the bucket with a damp cloth. You should always keep the base dry. Never submerge this unit in water. on 2009-07-03 22:40:42 it is a must have ! My friends think this bucket is awesome! very good for using as gardenlight as well. party is complete now with another fine product from chinavasion ! the product is very nice, it has lot of color and very fashion design,very good! !